Note: this post contains an image of a dead Bald Eagle that some readers may find graphic. Most rat poisons kill more than rats—they also pose a fatal threat to birds of prey. This topic recently made the news after a Bald Eagle on Cape Cod died of what appears to be rodenticide poisoning. The tragic story was picked up by several newspapers, and went locally viral on facebook. This issue should not only get attention when a culturally iconic species like a Bald Eagle dies. Nearly every raptor species is vulnerable to rodenticide poisoning, from Eastern Screech-Owls to Red-tailed Hawks. In fact, rodenticide poisoning is shockingly widespread. In one study, 86% of all raptors at a Massachusetts wildlife hospital tested positive for exposure to rat poison. The EPA recently banned a class of rat poisons called second-generation anticoagulants from the consumer market, but licensed exterminators are still allowed to deploy them. The ban came about because of the 10,000 children annually admitted to emergency rooms for rat poison exposure. The ban certainly helps limit accidental ingestion by humans, but unfortunately doesn’t do much to prevent birds from eating poisoned rodents. Second-generation anticoagulants don’t kill rodents immediately. While these rodenticides can kill rats with a single dose (which is why many consumers prefer them), poisoned rats can still live for a few days and continue eating poisoned bait. This delay means that rats can ingest enough poison to kill a much larger animal by the time they finally succumb. While any rodenticide can kill a raptor, second-generation anticoagulants are the most dangerous. The aforementioned Bald Eagle on Cape Cod likely fell victim to this class of rodenticide. 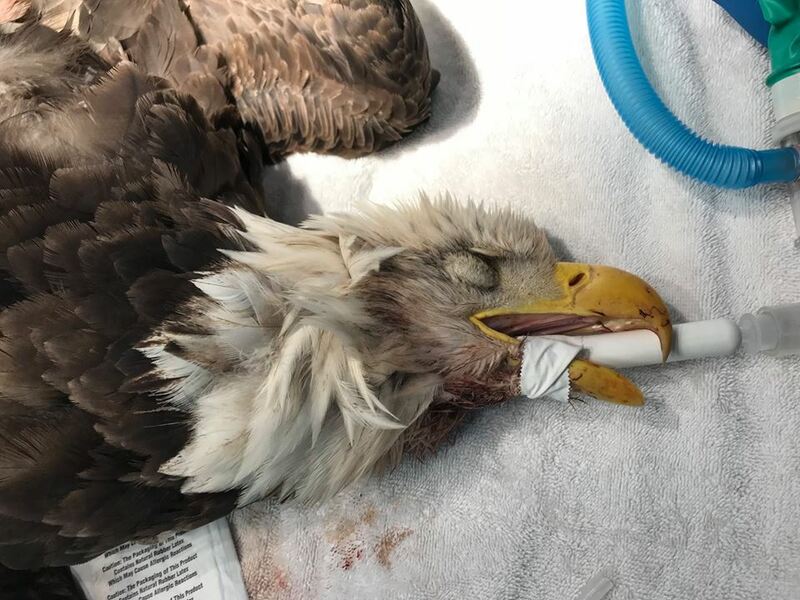 While vets at the Cape Wildlife Center are still waiting for test results to come back, the eagle was bleeding heavily, and its blood failed to form scabs or clots—a nearly sure sign of anticoagulant poisoning. 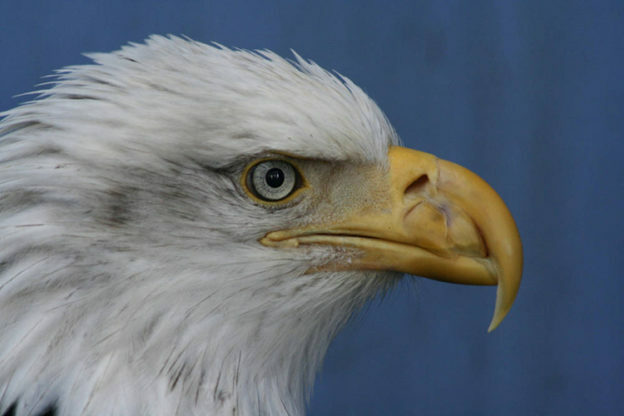 This Bald Eagle was admitted to Cape Wildlife Center, but sadly didn’t make it. Photo courtesy of Cape Wildlife Center. Native to Eurasia, brown rats have colonized much of the globe and become the most common urban rodent worldwide. These rats were among the first human-assisted invasive species, living aboard ships and rapidly spreading to other continents as early as the 15th century, much to the detriment of countless sensitive ecosystems. Rats and other rodents especially wreak havoc on species found only on small islands, and have driven several seabird species to extinction. Rat populations are on the rise, and towns are struggling to keep up (the town of Belmont even had to close a city park over a recent rat infestation). Rodent control is sometimes critical to the health of a city or an ecosystem—so what are some poison-free ways to prevent or control rodent problems? Prevention is the best cure for rodent problems. Rodent infestations only occur when there’s an easy source of food. Make sure your trash cans are scavenger-proof, cover vegetable gardens with net or wire, attach tree guards to the trunks of fruit trees. Limit access to shelter and hiding places that appeal to rodents. Seal up holes in your attic, basement, crawl spaces, and shed, and remove tree limbs within three feet of your roof. If a rodent problem has gotten out of hand and you choose to use an exterminator, try to pick one that practices “integrated pest management”— a multi-pronged approach that avoids chemical control methods. Finally, call your town or city hall and ask how the local government addresses rodent control. Suggest eliminating rat poison if it hasn’t been done already! This entry was posted in Conservation Issues, Resources and tagged birds and rat poison, rat poison, rodenticide poisoning, threats to birds of prey, threats to raptors on November 14, 2018 by William Freedberg. I have contacted the city of Quincy multiple times and they always say it’s a homeowner problem. I live in a neighborhood with many stone retaining walls- rat condos. Short of relandscaping the neighborhood, we have little chance of eliminating nesting sites. But apartment building dumpsters, neighbors’ uncovered trash are not something any individual homeowner can control. I catch as many as I can with snap traps, but some are too big, and they always come back.